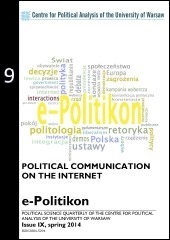 We are pleased to present the 9th issue of Political Science Quarterly “e-Politikon” published by the Centre for Political Analysis of the University of Warsaw. For the first time in our short history, we are publishing an issue entirely in English and entirely on one topic – political communication on the Internet. Couple of months ago we invited a group of scientist to focus on this particular phenomenon of the modern political communication and encouraged them to start their researches. Due to their engagement we have managed to gather a set of interesting articles that describe political communication on the Internet from many angles and perspectives. We open this issue with an article of one of the editors and Antoni Morawski who have run a quantitative research project on political communication in social media in Central Europe. Its aim was to determine the extent to which politicians used the most popular social media to communicate with Internet users. Authors have proposed a set of factors to describe this phenomenon, among them created Social Media Political Index – a political index of social media use that allows for comparing the phenomenon of political communication on the Internet within Central Europe. Barbara Brodzińska-Mirowska starts her article Unfulfilled Expectations (? ): Political Communication on the Internet in the Era of Professionalization with a remark that almost everyone expected new technologies to bring the potential that would increase the involvement in political issues among citizens. Reading the paper you will find out whether they were right. Tomasz Wierzbica shows characteristics of the Internet communication, seen not only from the perspective of political actors, but also from voters’ perspective and states that this channel of political communication creates new dimension of political rivalry. After abovementioned – rather general texts – we present you the world of Twitter. This social media channel, very popular in the USA, is expanding also in Central Europe. Bartłomiej Machnik places Twitter in the process of political communication, Małgorzata Adamik-Szysiak uses examples of leaders of the Polish political parties to show how they managed to align Twitter with their communication strategies and Tomasz Gackowski, searching for a communication revolution, started a reconnaissance research by examining activity on Twitter of ten Polish political leaders. One of the most popular social medium is of course Facebook and Kamil Giemza researched how Members of the European Parliament elected in Warsaw used this channel in their political communication. Wojciech Cwalina and Milena Drzewiecka conducted another research; in their article they have described results of an experiment whose purpose was to evaluate the effect of a negative political banner on the image and support for the attacked party. It has also been underlined that in terms of political communication on the Internet the phenomenon of memes arises. Two authors devote their articles to this issue: Marek Górka has treated memes as an example of carnivalized Internet communication and Michał Marcin Kobierecki has shown us how Poles use memes to express their political dissatisfaction. In one of the last two articles, Katarzyna Maksymowicz describes the significant impact social media has on politics and on handling political emergencies. After analysing the key characteristics of social media, the author takes a closer look at the notion of crisis as a social phenomenon and explores what use can be made of social media in the face of critical situations. Last article is written from different a perspective – Aleksandra Bagieńska-Masiota and Joanna Jaroszyk-Pawlukiewicz explore the issue of politicians’ right to privacy online from a legal viewpoint. The article concerns legal status of the Internet, considerations concerning the definition of a politician, definitions regarding the right to privacy, international privacy protection regulations and privacy of a public person in the jurisprudence of Polish courts.